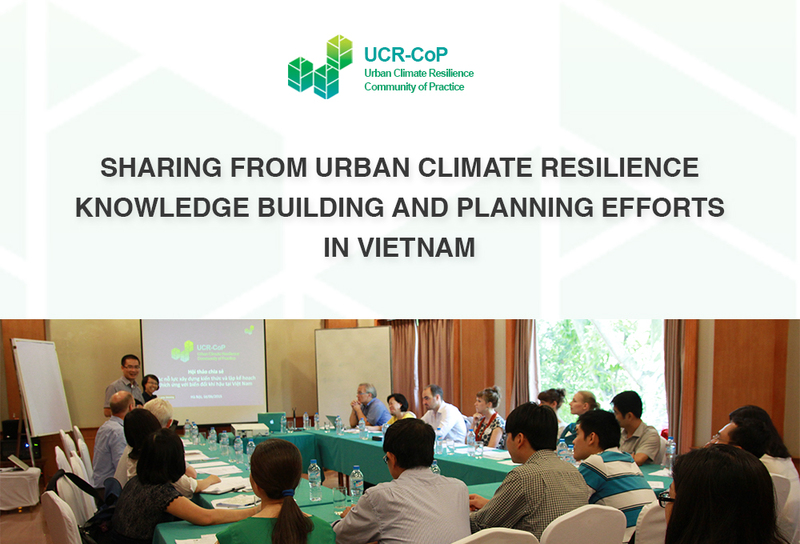 Sharing the experience and knowledge of training and research projects on urban climate resilience in Vietnam, and seeking potential cooperation are key objectives in mind for all 30 members who participated in the sharing workshop of UCR-CoP. The event was organized in Hanoi on June 16, 2015, with the participation of researchers, education/training professionals and students from institutes, universities and training centers related to urban professions and climate change, together with representatives from agencies of the Ministry of Construction and Ministry of Natural Resources and Environment, NGOs and consulting agencies in Vietnam. The workshop was an opportunity for members to access the value experience and information through the three presentations and a series of short bursts by UCR-CoP members. Dr. Do Hau shared with the workshop experience from professional training courses for urban planners and architects on urban climate resilience. The project includes three major activities: (1) Training need assessment; (2) Training course development; and (3) Pilot training courses in six provinces of Vietnam: Hanoi, Da Nang, Ho Chi Minh City, Can Tho and Lao Cai. The training highlighted a growing interest of urban professionals in fundamental aspects of urban climate resilience planning and development: the climate resilience approach, vulnerability and risk assessment, land use and infrastructure planning, public-private partnership, as well as in the international experience related to these issues. The summary of presentations and case studies from the training courses can be found here. How will climate change influence poverty and vulnerability of urban populations in the Southeast Asia region? Based on the knowledge and information gained from the academic literature and action research, how do we understand about urban governance that is climate resilient and equitable? How to strengthen the capacity of individuals, groups and organizations to improve economic prosperity, infrastructure and social welfare in urban areas, especially in response to climate change? For more information related to the program and its scholarship, please contact Dr. Nghiem Phuong Tuyen at tuyen@i-s-e-t.org. 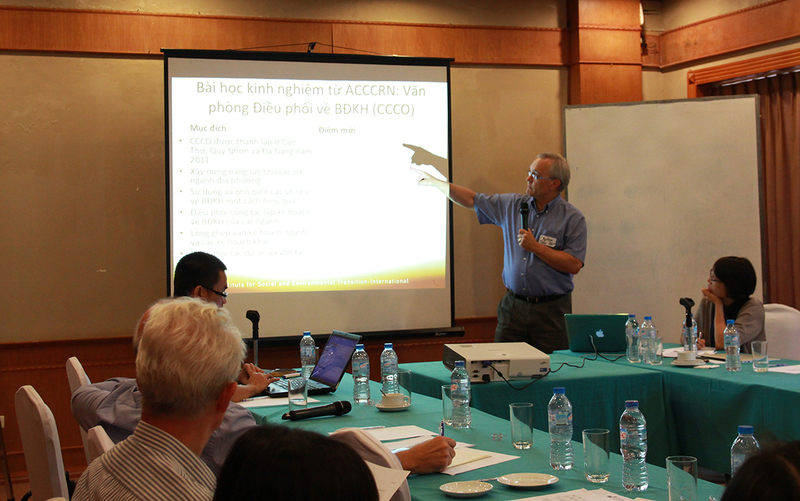 Dr. Stephen Tyler started his presentation by reminding participants about the national mandate for all provinces in Vietnam to develop Climate Action Plans, especially in the context of the new Circular 50 by Ministry of Natural Resources and Environment (MONRE) and Ministry of Home Affairs (MOHA), which takes effects on November 20, 2014. He continued by explaining why DONRE cannot deliver on the Climate Action Plan mandate. Dr. Tyler discussed the example of a coordination agency model—Climate Change Coordination Office (CCCO), a technical agency set up under the provincial PC—with the objective of coordinating climate action planning across sectors and making sure climate change is integrated into sector plans. He also talked about existing challenges to the CCCO model in Vietnam. Besides the three key presentations above, the workshop also featured short bursts where other UCR-CoP participants shared their ongoing project efforts and results. Short burst by Ms. Lisa Buggy, Center for Community Health and Development (COHED) on the project “Protecting urban livelihoods from climate change – Building heat stress resilience amongst Da Nang’s most vulnerable workers” In her presentation, Ms. Lisa described a current issue that many manual workers in Da Nang city have to work outdoors while summer temperature keeps increasing with climate change. 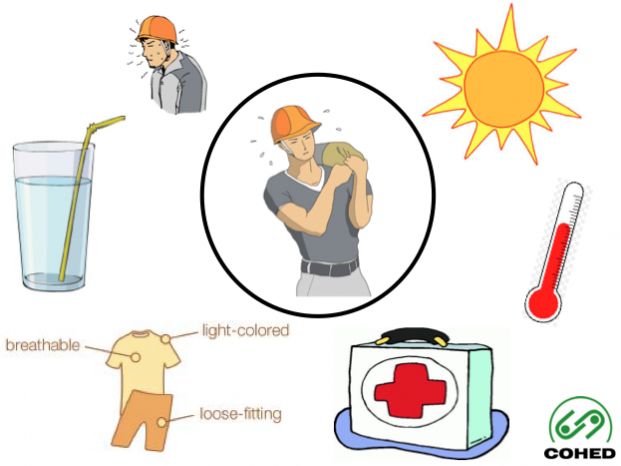 Under the project, COHED worked with three corporations in Da Nang to provide them with support and tools to better understand and implement measures to protect the workers from increasing heat stress risks. In addition, the workshop also gave an introduction of the Asian Cities Climate Change Resilience Network (ACCCRN), which is the regional network that supports individual practitioners, institutions and country networks like UCR-CoP for climate change resilience across Asia. To sign up as members of this network, please visit acccrn.net. For more detailed information of the presentations and sharing in the workshop, please refer to the Events page. All UCR-CoP members will receive the detailed notes of workshop contents and related discussions. Thank you very much for taking part in the very useful sharing and discussion at the workshop. This entry was posted in Climate Change, English / Tiếng Anh, flood management, Meeting Briefing, urban planning, Urban resilience and tagged CCCO, city resilience index, climate action plan, heatstress, private sector, scholarship, training, UCRSEA, urban climate resilience, urban drainage. Bookmark the permalink.